Ever since we added our master seamstress to our team, we’ve been able to create a ton of new home decor sewing projects for the site. We try to have a healthy mix of both year-round home decor and seasonal home decor for you to play around with as the months go by. This winter we’ve been experimenting a lot with faux fur projects because it is such a fabulous texture for seasonal home decor. 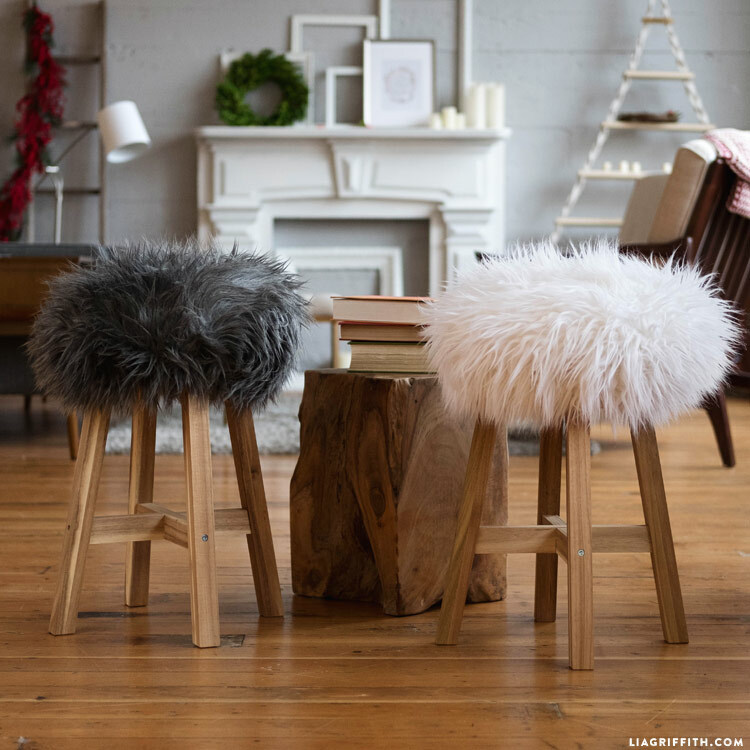 Our personal favorite is our faux fur throw blanket, but these new faux fur stools are definitely stealing our hearts! Before starting your faux fur stools, we highly recommend looking over our tips and tricks for sewing with faux fur. Working with fur is different from regular sewing in a lot of ways, so we want to be sure you’re set up for crafting success! The first step for this project is picking out your faux fur. We found our white and grey furs at our local fabric store – they are Shannon Fabrics brand with a 2-3 inch pile. While we were at the fabric store, we also picked up a couple of basic round pillow forms, around 16 inches in diameter. 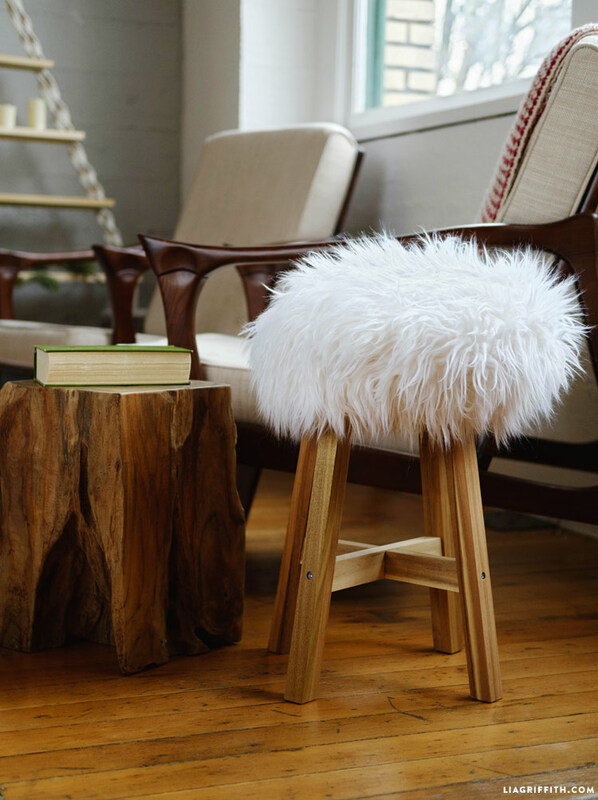 We found our simple wood stools at Ikea, our go-to for easy Scandinavian design elements. 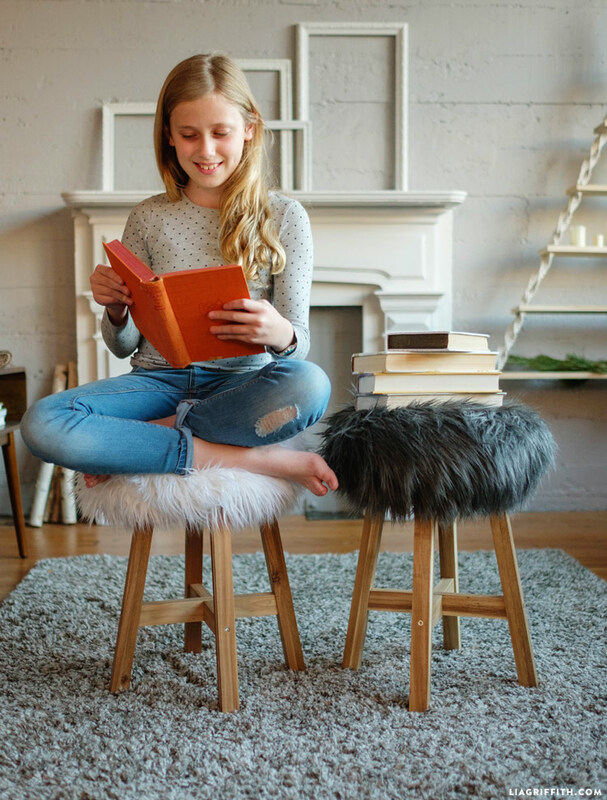 Download the printable instructions for a full list of materials, and then follow the step-by-step photo tutorial for the faux fur stools below when you are ready! This project is relatively easy once you get the hang of working with the material, and it is a wonderful way to add a unique accent piece to your home decor. Simple white faux fur home goods incorporate well into a number of different home decor styles. This project is especially great for experimenting with adding new texture to your decor. When you finish, sit back and enjoy! Thanks for the tutorial, its lovely as always! That squared off log side table is also wonderful! Is it possible to know where it came from?